WhyHunger staff members Brooke Smith and Alison Cohen were in southern Arizona in February to work with the regional network called Somos la Semilla, formed as a response to the need to work across sectors, counties and communities in order to build capacity to see the food desert that this rural part of the state has become, bloom again with robust local food and farming economies and access to fresh, healthy food. 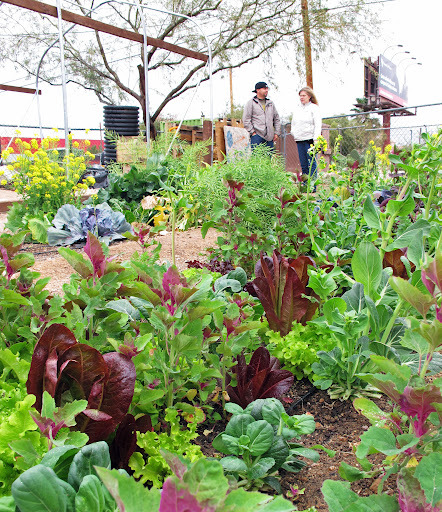 February 18, 2012 – Tierra y Libertad Organization (TYLO), a Tucson-based grassroots neighborhood organization, is one of five recipients of the 2012 Harry Chapin Self-Reliance award to be honored at WhyHunger’s annual dinner on June 13, 2012. We met Cesar Lopez on a chilly Arizona morning last week outside of a small house in a barrio on the south central side of Tucson. The house is known simply as “el centro” to the residents of this low-income neighborhood who come here to gather, support one another, and make plans for “developing a barrio culture of food justice.” Cesar, an energetic and driven community organizer with TYLO, greeted us outside of the house in front of a vibrant tile mural paying homage to the Mexican heritage of the majority of the barrio’s residents. We spent the next few hours with Cesar as he toured us through the alleyways, backyards and school grounds that had been transformed by TYLO’s work to organize the community to envision and create the kinds of public spaces, social networks and entrepreneurial activities that make a community healthy, safe, beautiful, robust and full of possibilities. Cesar – who talks as fast as any New Yorker – walked us through the demonstration permaculture garden that was beginning to grow out of every crevice of the property. In imagining the future of the completed permaculture garden and those that would be replicated throughout the neighborhood, Cesar described the “food forest” that a barrio resident would come home to after a long day at work. A trellis of grapes would serve as the garage; cilantro, thyme and mint would waft in the slight breeze along the walkway towards the front door; chickens or ducks would noisily greet you from their pens; hummingbirds would abound; and a bountiful garden with a diversity of fruit trees and vegetables would fill your senses as you made your way to the backyard; you were home. While gardens, fresh food, safe alleyways and micro-businesses defined some of the outcomes of TYLO’s work, the backbone of every project and success story is the model of community organizing and distributive democratic leadership that TYLO embraces. Cesar introduced us to two community organizers like himself – two women: Sharayah, a recent graduate with a degree in architecture and landscape design who represents the third generation of women to grow up in the neighborhood; and Rosalva, a first generation Mexican immigrant who came into the country without documentation some years ago, attained citizenship after years of struggle and is raising her children in Tucson. Rosalva described her own fear as she went about her daily business – whether taking her kids to school or going to the grocery store – of being discovered without papers and immediately separated from her children. Her experience led her, with the support of TYLO, to put in place a “red de proteccion” or a support network specifically designed to deal with the crisis that ensues if an undocumented member of the community is detained by the border patrol. A typical scenario is that the adult who is stopped is taken to a holding center and often deported before they have the chance to gather their things, tie up loose ends or – most disconcerting — contact family members. The “red” operates like a phone tree of sorts. Once a member of TYLO is notified about a detainment, the phone calls ripple throughout the community and within hours neighbors jump into action – one picks up the children from school and makes sure they’re cared for, another contacts the person’s employer, still another begins the legal process enlisting the immigration lawyer on call. This structured support network is a vital service in a community where the circumstances of a person’s life – often a parent – can turn on a dime without recourse. And it gives individuals the courage to organize with their neighbors and participate in community life despite documentation status.